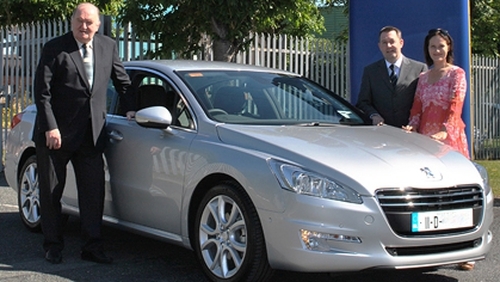 Journalist and broadcaster George Hook has taken delivery of a new Peugeot 508 Allure 2.0 HDi 163bhp 6-speed automatic saloon. Peugeot Ireland says "confident and daring, the quality new Peugeot 508, winner of Fleet World's Best New Car of 2011, is a perfect partner to the latest Peugeot brand ambassador". A delighted Hook said, "I've been a Peugeot driver on and off for many years and first drove a Peugeot 504 back in the 1970s. "This is my fourth Peugeot and I'm thrilled with the new Peugeot 508. I test drove it for a week during a recent Newstalk promotion and as I told my listeners, I was very impressed with the big family car. "As soon as I got the keys, I headed off to Cork to interview Maureen O'Hara for a Newstalk feature - the car was a pleasure to cruise along the new motorway." Peugeot Managing Director George Harbourne said: "George is an excellent brand ambassador for Peugeot. We very much look forward to working with him to increase the awareness of the Peugeot brand in Ireland, through his high public profile." Retailing from €24,895 plus dealer delivery related charges, Peugeot's newly launched 508 has been awarded a five-star safety EURO NCAP award. Hook's new top-of-the-range 508 Allure model comes equipped with a keyless entry 'open & go' system, full leather upholstery, ESP, hill assist, an electric parking brake, heated/electric front seats, front and rear parking aid with space measurement, automatic wipers and headlights, cruise control with speed limiter, Bluetooth, ultrasonic alarm, climate control air conditioning, front and rear electric windows, six airbags, electric folding door mirrors, front fog lamps and 18" alloy wheels.